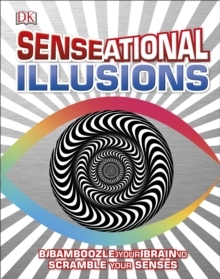 Senseational Illusions is packed with tricks, challenges and illusions that put your five sense to the test, in ways you’ve never seen, heard, smelled, felt or tasted before. See how optical illusions trick your eyes, feel your way around tactile mazes and test your hand-eye co-ordination with a 3D ball-bearing maze. Plus try out lots of other tricks, experiments and illusions. The newest book in the award-winning Illusions series, including Optical Illusions and Mindbenders, packed with graphics, fact-boxes and interactive tricks and experiments to engage even the most reluctant kids.